Are you taking your daily vitamin D supplement? You should be, especially during the winter. New research finds that Americans' vitamin D levels vary throughout the year, peaking in August and bottoming out in February. Vitamin D, which is produced by the skin when exposed to sunlight, is essential for bone health. It's also believed to play a role in seasonal illnesses like colds and the flu. For this study, researchers measured vitamin D levels in 3.4 million blood samples collected weekly in the United States between July 2006 and December 2011. "Even with food fortification, vitamin D levels in the population show a high level of seasonality due to the influence of sunlight," said study author Amy Kasahara. "In this study, we have shown that vitamin D levels lag the solar cycle, peaking in August and troughing in February," she said. "Our analysis, combined with other data, will help contribute to understanding the role of vitamin D in all seasonal diseases, where the simple winter/spring/summer/fall categories are not sufficient," said study senior author Andrew Noymer. 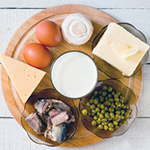 Boost your vitamin D intake with a daily supplement, and be sure to include plenty of vitamin D-rich foods in your diet -- egg yolks and oil-rich fish such as salmon, sardines, and tuna are excellent options, as are vitamin D-fortified milk and cereal.